Nelson Denis’ Followers will see this interview as him telling it like it is because he has created a cult. Hence, whatever he says must be true and like gospel, it should go unchallenged. If you pay attention to his remarks and you know a little bit of history you will notice that his interview is marked by empty statements, the inability to differentiate between time periods, administrations, different departments of an Imperial bureaucracy, and a complete incapacity to see the big picture and to put Puerto Rico’s history within a global context. The cult of personality is so dominant in his narrative that you have to wonder why he didn’t call his book “Ode to Pedro Albizu Campos” or “The Second Coming”. He claims that the “the history of Albizu is the history of Puerto Rico” and ultimately, since Albizu was a victim of imperialism (that is how he portrays him) Puerto Rico and all Puerto Ricans can’t help but to be victims. But these victims had a world stage so, when US citizenship is extended to Puerto Ricans in 1917, it is done (according to Denis, poor scholarship and popular wisdom) because the US needed cannon fodder or super soldiers to send to France (it depends in your romanticized view of Puerto Ricans- either peace loving let’s have a good time kumbaya thingy, or brave by nature). For the last time: Puerto Ricans were not given citizenship so they could be drafted. Denis is such a neophyte when it comes to history that even though he is citing (and way too heavily) from books (and poorly and out of context) he writes and speaks as if he just found some truth. No, you did not Mr. Denis. The people you are poorly citing did! He was asked fair, even friendly questions but he still botched the answers. In minute 27 when asked about his representation of the colonial system in P.R. as a “unilateral manifestation of power” he has a Palinesque moment. His response is so defensive and empty that he makes Palin look coherent by comparison. It wasn’t the first nor would it be his last Palisneque moment. In a statement that would please Boricua Trekkies he invokes the Borg and essentially claims that resistance was futile until Albizu (now turned into Captain Piccard) came into the picture. Between minutes 35-37 he wonders “in what universe” could Puerto Ricans challenge and change the American Colonial Project. (Evidence be damned). He is unable to answer the question “Why there isn’t more agitation against the colonial system in the island?” (Minute 44) Instead of answering the question, he resorts to a trivial account of history going from P.R. being isolated, to the U.S. controlling the media, etc… The FBI turning brother against brother (Minute 50-53) Nagasaki and Hiroshima, September 11, the list is long… I think this is called Dodging 101. But seriously, the worst thing about his comments is that he is condescending to the interviewer, Dr. Teresita Levy. He talks to her alternating between being incredibly defensive or arrogantly condescending. Moreover, he tries to school a professor of Puerto Rican History and Studies, and a top Agro-Economic historian at that, about the island’s agrarian history. 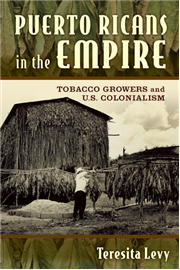 He also tries to school Dr. Levy- (author of Puerto Ricans in the Empire, Tobacco Growers and U.S Colonialism http://rutgerspress.rutgers.edu/product/Puerto-Ricans-in-the-Empire,5326.aspx ) about the nuanced ways in which imperialism operates and how to understand history. 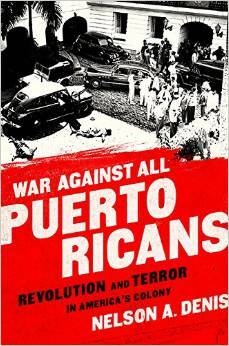 Anachronism after anachronism, poorly-thought metaphors, hyperbolized or completely made-up and discredited “events” (including his book title “War Against all Puerto Ricans” a phrase which was never uttered) complete Denis’ repertoire. And this is why historians can’t engage with him. He is not interested in a debate or even a pseudo-intelligent conversation but in people to accept his new found truth. He is spreading the good news of Neo-Nationalism and he is ready to teach and awaken Puerto Ricans and to lead Puerto Rico out of its colonial miserable reality. Kudos to my colleague Dr. Levy for giving it a shot and for acting so professional even when Denis was being completely condescending. That there wasn’t a real conversation was not her fault.